Quelle est la prochaine étape de votre financement? Avec des racines remontant au 16ème siècle à travers l'Europe et plus de 1300 sociétés cotées, les marchés d'Euronext sont les plus grands marchés de capitaux en Europe afin de vous aider dans votre développement. Implanté à Amsterdam, Bruxelles, Lisbonne, Londres et Paris, Euronext est en effet le centre majeur de levée de capitaux pan-européen offrant à votre entreprise le plus vaste choix d’outils de financements tant sur le marché actions que sur le marché obligataire. Entreprise de toute taille, domestique ou internationale, les marchés d'Euronext ont été spécifiquement conçus pour répondre à vos besoins et vous faire bénéficier du meilleur accès aux marchés de capitaux. Doté d’une technologie de pointe avec sa plateforme UTP - Universal Trading Platform - qui relie et intègre l'ensemble de ses marchés européens, Euronext vous permet d'accéder à une large base d'investisseurs de la zone euro, mais également à l’international (Royaume-Uni, Etats-Unis, Chine, etc.). Parce que nous sommes convaincus que faire appel aux marchés de capitaux est l'une des décisions les plus importantes pour votre entreprise, Euronext met à votre disposition une gamme complète de services et des équipes dédiées pour accompagner la réussite et le développement de votre entreprise, accroître sa visibilité et son accès à la liquidité. TechShare : Les candidatures sont ouvertes ! La 4e édition de TechShare ouvre son recrutement. Vous avez certainement entendu parler des indices boursiers , mais pourquoi sont-ils si utiles ? Amsterdam, Brussels, Dublin, Lisbon, London and Paris – 1 April 2019 – Euronext, the leading pan-European exchange, announced today it has received the declaration of non objection from its College of Regulators for the contemplated acquisition of up to 100% of the capital of Oslo Børs VPS. This approval further improves the certainty of execution of Euronext's acquisition of Oslo Børs VPS by meeting one of the condition precedents of Euronext’s Offer, available on www.euronext.com1. Euronext remains convinced that it represents the most attractive strategic partner for Oslo Børs VPS and for the Norwegian financial and business community. Euronext is committed to make Oslo Børs VPS stronger and to deploy a new ambition for the Norwegian capital markets with the support of the key players of the financial community in Oslo. Euronext is pleased to announce that Tom Vidar Rygh, Senior Advisor at international private equity fund Nordic Capital and previous Chairman and Member of the Board of Oslo Børs, has accepted to join the board of Oslo Børs VPS as an independent board member when the contemplated transaction is completed, subject to the usual regulatory approval. His strong profile and connection with the Norwegian ecosystem will support Euronext’s growth ambitions in the Nordics (see biography below). Euronext reiterates that it has already secured a majority of the Oslo Børs VPS’s shares, that its minimum ownership condition has therefore been fulfilled and that it will complete the transaction once regulatory clearance has been obtained. As of today, Euronext has secured 53.1% of the share capital of Oslo Børs VPS through a combination of 8.1% of shares owned directly and 45.0% of shares committed to Euronext in the form of irrevocable pre-commitments and tendered shares. Euronext’s offer is currently awaiting regulatory clearance from the Norwegian Ministry of Finance in accordance with applicable laws and regulations, which is the last major condition precedent to complete the acquisition of the majority of the Oslo Børs VPS’s shares. Euronext’s Reference Shareholders, who represent 23.86% of Euronext capital, have also confirmed their joint support to Euronext for this transaction. Tom Vidar Rygh is Senior Advisor at Nordic Capital. He holds an MSc in Business Administration from the Norwegian School of Economics and Business Administration. A former Partner of Nordic Capital, he has also held various leading positions within industrial and financial companies, including Executive Vice President of Orkla ASA and CEO of SEB Enskilda AB. He has been a director of several listed and unlisted companies in a number of different sectors, including Telenor ASA, Carlsberg Breweries A/S and Storebrand ASA. He is also a former Chair and Member of the Board of Oslo Børs. New York, 26 March 2019 – FastMatch, Euronext’s Electronic Communication Network (ECN) for Foreign Exchange (FX) trading, announced it is setting up a new matching engine in Singapore, which is expected to be fully operational in the fourth quarter of 2019. In addition, FastMatch has opened a new commercial office in Singapore to better serve customers in Asia. This expansion in the Asian market reflects FastMatch’s ambition to be closer to its clients worldwide and creates a strong development base to become a major FX marketplace in the region. The new matching engine, which comes in addition to the matching engines located in New York, London and Tokyo, will allow customers in various Asia-Pacific markets including Singapore, Australia and Hong Kong to benefit from an improved trading experience and connectivity. MAS aims to develop Singapore to be the global FX price discovery and liquidity centre in the region, as outlined in its Financial Services Industry Transformation Map. It encourages key FX players to enhance e-trading infrastructure by setting up their matching and pricing engines in Singapore, enabling regional market participants to benefit from better liquidity and greater efficiency in executing FX transactions. Lisbon, 13th March 2019 – Euronext and Nova School of Business and Economics (Nova SBE) are pleased to announce their partnership in bringing the TechShare campus to Portugal for the first time. Taking place on the 15th and 16th of March at Nova SBE, the TechShare programme will gather over 100 tech companies from 8 different countries. The top executives of these tech companies will work with Nova SBE professors in group workshops on business-related topics including internationalization strategy, leadership and culture, while life sciences companies will follow courses on the specificities of financing and growing with capital markets in their field. In addition, the participants will have dedicated interactive sessions with successful entrepreneurs listed on Euronext as well as the opportunity to attend a panel discussion on how to manage and optimise relationships with the financial community. The companies participating in the programme represent the vibrancy and diversity of the tech ecosystem in Europe, and span a wide range of sectors including among others biotech, medtech, electronics, hardware, cleantech, software, digital services, e‐commerce, media and fintech. On average, participants generate annual revenues of €14 million, and employ c93 staff. They are also at an increasingly mature stage of growth as two‐thirds are venture capital‐backed having raised on average €17million in capital. Amsterdam, Brussels, Dublin, Lisbon, London and Paris – 11 March 2019 – Euronext, the leading pan-European exchange, announces today that it is amending its Offer to acquire Oslo Børs VPS’s outstanding shares by extending the Acceptance Period thereof. Following this, Euronext will continue to receive and accept acceptances of the Offer up to 1 April 2019 at 18:00 Central European Time. All other terms of its Offer as revised on 11 February 2019 remain unchanged. Defined terms with capital letters herein have the meaning as in Euronext’s Offer Document published on 14 January 2019 and available on www.euronext.com2. Dublin – 7 March 2019 – Euronext today announced the results of the annual review for the ISEQ® family indices. The review did not give rise to any changes, as detailed below. Euronext retains the right to change the published selection, for instance in case of a removal due to a take-over, till the publication of the final data after close of Wednesday 13 March 2019. All events happening after that date will not lead to a replacement of the selected company that possibly needs to be removed from the final selection. The ISEQ family is reviewed quarterly in June, September and December. The full annual review is in March. The quarterly reviews serve to replace removed constituents and to facilitate inclusion of recently listed companies. 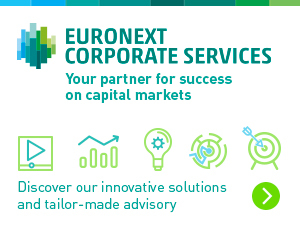 Euronext subsidiary dedicated to supporting the growth of Small and Mid Caps across Europe. In order to offer Tech SMEs the help they need to finance their growth, EnterNext is launching a series of EnterNext Tech Conferences in France, Belgium, the Netherlands and Portugal.